Shounen Maid ( Boy maid literal translation )studio 8bits’ newest manga adaptation and a show which managed to split people right in the middle , when the first trailer came out I remember seeing on a forum one person saying “ how cute , can’t wait to see this “ and another “ WTF Japan this is disgusting “. I can see the appeal of this type of series for some people, yet have never really had much interest in this sub-genre of moe myself. So this was my first time watching this kind of show and I found it to be much like any other moe show and enjoyable experience with this one actually holding some emotional weight and a bit of depth and far more innocent that people thought it’d be. Now this story actually gripped me because it took far more of a leap than most slice of life shows are willing to. Every slice of life begins with a change , usually moving to new school or something along those lines but rarely does it have to do with the death ; even more so the death of such a close family member. This gives the show that advantage in emotional depth and it was really heartwarming to see Chihiro slowly move past the initial and settle into life with his uncle and deal with his emotions. But she’s never forgotten and in the middle of all the comedy will sometimes pop up in a small thing like him cooking eggs the way she did. It handles both tones very well and makes sure not to leave the audience to melancholy nor care-free. Now it’s not all sorrow, there’s a whole lot of comedy, both visual and in dialogue and actions. Some of the jokes and the style of gags are fairly standard but it’s a formula that works well since I was almost always smiling. I was also so glad that every character mentions how strange it is that he wears a french maid's outfit. The soundtrack is very bouncy and light. Not having or having minimal music during the clearly emotional moments is a nice touch. The opening is charming and very action packed which doesn’t really describe the general animation but is still inventive. We have a very high profile cast with Shimazaki Nobunga who’s played many main characters before ( Free !, Ore Monogatari, Kizna over) potraying Takatori Madoka ( the uncle ) and even more impressive is how genuine and convincing Fujiwara Natsumi is as Chihiro seeing as it’s her first ever accredited voice acting job. The animation and art are both rather muted but have a very appealing and pleasant minimalist style which is preferred in a show with little action. The larger backdrops are often great. Most of the gags/visual jokes are done with chibi-faces and floating text. Both are heavily stylized and blend in with the simultaneous jokes. The lighting and shadow work works well to set mood and I was also pleasantly surprised at how having a basic day/night cycle in each episode made the characters feel like they were progressing rather than getting stuck in one place 4 episodes in ; as this type of show usually does. Shot composition has a lot of thought put into it so that a conversation can switch between angles and keep the viewer engaged. There are a few nice shots but nothing really extraordinary. I was impressed in how I was engaged all the time while basically watching people just do chores and housework due to the detailed animation and clever editing. Continuing with the minimal style the characters are share the rather simple pencil drawing style that works very well coupled with their large button eyes. Individually however they do not stand out that much from other shows. Chihiro our MC is very likeable and displays a wide range of emotion , he has a short temper but doesn’t come off as bitter nor irritate the viewer and is earnest and hardworking but not to the point where he doesn’t feel like a real child. I feel that a lot of people were suspicious of the Uncle Takatori since they imagined him pursuing a romantic relationship with Chihiro. He’s eccentric and absent-minded but still cares for Chihiro and wants him to be happy and I can really feel them learning about each other and growing closer as a family in the background to all the jokes. The supporting cast are admittedly more one sided and with one defining point but that allows them to connect with Chihiro and gives us some interesting relationships with good development. The best of course, being him and his uncle. The clashes in personality are always comedic and there’s never a feeling of hostility which makes it an overall very pleasant show to watch. While the character animations are admittedly quite primitive their stylized natures covers it quite well and the speed and variety in the chibi keeps it from being dull. I do think however that a lot of people are going to give this one a pass as they see it as a sexualisation of a young child and aren’t comfortable with those themes. These were my initial thoughts too and I was sort of dreading watching it. 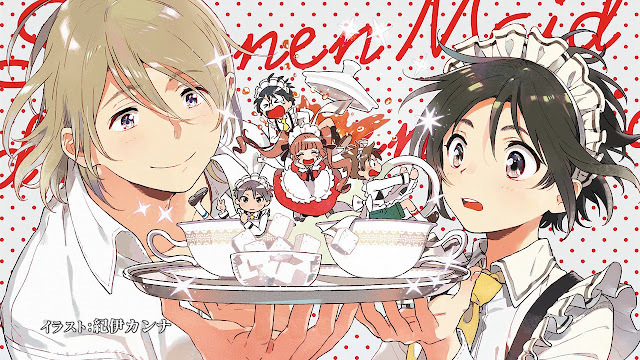 I feel if the advertising had gone more on the “ Shounen “ and the emotional and narrative depth this shows carry’s hidden inside and less on the “ maid “ more people would be willing to give it a chance.